It felt like the 2017 title was easily going to be Hamilton's this weekend, but first and second corner drama at the start of the race meant we were in for an intriguing battle. The crowd were cheering loudly as their home favourite did well, but equally they loved seeing a great fight by some top quality drivers. Lap by lap coverage of the race follows, from the opening moments with drivers jostling for position into the tight first corner, to the closing scenes were all eyes were not on the winner crossing the finish line but firmly behind him. Verstappen wins after Hamilton and Vettel collide on the first lap, dropping to the rear of the field. Vettel fights back to fourth but needed second to stop Hamilton winning. Lewis finishes ninth but secures fourth world championship. Daniel Ricciardo retires with engine problems in his Red Bull. Three other Renault engines also retire for Hartley, Hülkenberg and Sainz. Ericsson retired with a significant fire on his Sauber. Hello there, welcome to the Factbyte Factbox for the Mexican Grand Prix, the race that could be the title deciding event for the 2017 season. With half an hour until the race gets underway, the pit lane has opened, engines are roaring and cars are starting to make their way to the grid. Pirelli have brought the ultrasoft to Mexico for the first time, and drivers are favouring that tyre as the quickest across the track's smooth surface. Degradation isn't expected to be a big issue here. In fact, the biggest issue is the high altitude and therefore low air pressure, which has been affecting components here and there. Toro Rosso have had a particularly tricky time of it with regards to engines. They, and McLaren, are propping up the last two rows of the grid. Tweet from @lukehmuse: "Not sure what it says about the state of the penalties in F1 that the final grid order has been announced less than an hour before the race"
The final official grid is usually published about this time before a race, one hour or so, but it's unusual to have such late changes that make such a big impact to the top ten. Turn one is the heaviest braking part of the circuit, following a long straight. Going into the first corner at the start of the race is going to be fascinating, as it usually is! Tweet from @ForceIndiaF1: CHECO! CHECO! CHECO! We think the crowd’s favourite has reached the grid! Lewis Hamilton has a commanding lead in the championship now. He could have won last weekend in America, but Vettel's second place finish allowed him to continue the fight to this weekend. The odds are very much against him though, as Hamilton needs only to finish in the top five and secures the title, no matter what Vettel does. Tweet from @karunchandhok: A very smokey fire up for @carlosainz's car on the grid! Hamilton radio complains of the seat being really hot on his back, "you need to make sure you cool it next time," he says. Risk of rain for this session is 0%. Almost all the grid are starting on ultrasoft tyres. Just Grosjean in 15th and Alonso in 18th have the soft tyres on. The grid starts to clear for the formation lap, mechanics taking sidesteps to move to the verges. Formation lap begins, Vettel speeds off for a surprisingly quick pre-race lap. Through the stadium, crowds cheering, and then round the final corner as Vettel slows the pace and crawls to his front row grid slot. Verstappen pulls in alongside him. Vettel gets a good start, then it's three wide as Verstappen and Hamilton pull alongside into turn one. Verstappen moves up into the lead, as Hamilton and Vettel bang wheels. Hamilton is going backwards... he's got a puncture! Bottas has moved up to second, as Hamilton drops back and then dives into the pit lane. Vettel has also come into the pits, he must have had damage as well. Front wing change for Vettel. Both he and Lewis put on the soft tyres, yellow stripes. Tweet from @becclancy: "Vettel out in eighth. He has to finish 2nd and Ham out of points to keep his title alive.So still Ham's title - at the moment." Ocon is up into third, with Hülkenberg behind him. Pérez surged up four places to sit fifth. Carlos Sainz has come in super early, changed to the yellow softs and is on his way once again. Verstappen has stretched a 2 second lead already. Sainz has rejoined the race between Vettel and Hamilton, all three at the rear of the field. 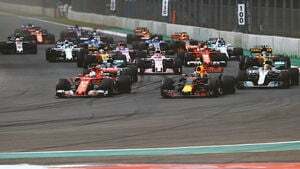 Replays show Vettel and Verstappen made slight contact in the first corner, then Hamilton and Vettel clouted in the next. "Simply, simply lovely," Verstappen said over the radio as he elbowed his way into the lead. Tweet from @ForceIndaiF1: Esteban has opened a 1.6s gap on the Hulk - enough to shake him off from DRS range. Ricciardo has come into the pitman, and he's stopped in the box looking like he's going nowhere fast. The Renault engine is not dealing well with the altitude at all this weekend. Massa and Vettel have dispatched Pascal Wherlein, and there are two Toro Rosso next in line for their progression. Ted News: Both Sainz and Massa had punctures, which is why they've had to change their strategies. Vandoorne is chasing down Ericsson, and is informed over the radio that the Sauber driver is suffering from temperature issues. Sebastian Vettel closes in on the Williams of Massa, but runs out of road before he has a chance. Down the next DRS straight, he pulls out wide and still can't make a move. Kimi Räikkönen is also looking for a way past the car in front - this time the Mexican driver Sergio Pérez. Replays show Grosjean and Alonso came together, with Haas now concerned about front wing damage. This time, Vettel pulls alongside Massa again, but runs wide off track as he tries the overtake. He does get the position, but that might be another the stewards take a look at. Marcus Ericsson is doing a great job up in ninth, but is leading a train of two McLarens behind him. Vettel passes Gasly to move up to 14th place. Grosjean is next on his hit list. On the radio, Gasly is instructed to stay close to Vettel in order to increase his chances of overtaking Grosjean as well - but he's being left for dust behind the Ferrari. Sergio Pérez comes in to the pit lane for his probably one stop of the afternoon, soft tyres going on the Force India. He rejoins in eighth place. Lewis Hamilton is complaining that he's not making progress through the field. "Just to get past these guys is difficult." Hülkenberg also pits, rejoining ahead of the Force India of Pérez, seventh place. Waved blue flag for Car 44 Lewis Hamilton timed at 13:31:30. Hamilton hasn't seen a blue flag since 2013! "It's crazy I'm fighting for this position," Hamilton says. Tweet from @pirellisport: Unfortunately for @LewisHamilton and #Seb5 it’s a clear one-stopper here so not much extra can be done on strategy to boost their prospects. Ted News: No obvious damage to Hamilton's car on the telemetry, according to the team. Nico Hülkenberg has pulled off track, the German driver retiring from another race. That's four out of the last five races that have ended in DNF. Team radio to Nico Hülkenberg: "Stop the car, Nico. The car is not safe. You need to get out by climbing on to the front and jumping off." That's an ERS issue there then. That retirement promotes Vettel into the top ten. 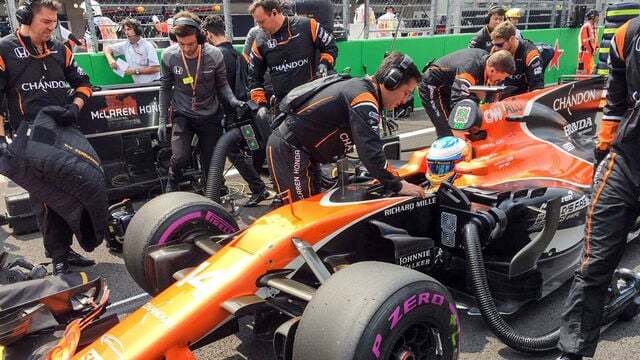 He has passed Vandoorne and now has Alonso ahead of him. Lewis Hamilton has, AT LAST, managed to get past Carlos Sainz, so is no longer running last. Mercedes radio suggests they might consider a second pit stop for Hamilton if his tyres wear out too quickly. It's Pascal Wehrlein who now has his mirrors full of the Mercedes of Lewis Hamilton. Marcus Ericsson has pitted, which drops him out of the points. Vettel up to ninth but still chasing Alonso. Hamilton dispatches Wehrlein, and now has four seconds to close to the other Sauber of Ericsson. Virtual Safety Car. And so, the pit lane gets very busy. Everyone that hadn't pitted has now come in, whilst some have opted to come in for a second stop, including Lewis Hamilton, Carlos Sainz, and Sebastian Vettel. Vettel, Alonso, and Sainz are on the ultrasofts now. Hamilton has bolted on the red supersofts. Virtual safety car ending. Track is clear. Lance Stroll is running a blinding strategy at the moment. He hadn't stopped and took full advantage of the stop under the VSC. He's up in fifth place, with fresh tyres on. Vettel is in eighth, and trading fastest laps with those out front. Meanwhile, out front, Verstappen is setting the fastest lap - a track record - and holding a comfortable ten second lead over Bottas. Tweet from @JennieGow: So Mercedes think Vettel can go to the end of the race on the ULTRA’s - HAM only had used ULTRA’s so they put him on the SUPER SOFTS. All three tyres are in use at this point in the race. Three drivers on ultrasofts, seven on supersofts, and seven on softs. Tweet from @ForceIndiaF1: Esteban goes green, Checo goes green - our duo are still fighting hard out there! A lot of drivers here, but just to show the job Vettel has on his hands. Hamilton is eyeing up the Sauber of Marcus Ericsson, he's not being aggressive out there today, despite the fact that the championship isn't really in his hands at all. Tweet from @LukeSmithF1: Bet Hamilton always dreamed of winning his fourth world title after a wheel to wheel fight with Marcus Ericsson. Vettel is the last driver on the lead lap at the moment. Everyone from eighth down has been lapped. Hamilton finally makes it past Ericsson, moving in to 12th place. Team radio to Lewis Hamilton: "We are forecast for P8, if you can keep up this pace." Field spread is starting to hit now. A much calmer section of the race. Vettel has the Force India of Pérez firmly in his sights now... how hard will the Mexican make it for Sebastian? Vettel outbrakes the Force India, clings on for dear life and makes it stick. Impressive work from the German. Two seconds to catch Lance Stroll and Vettel will have his next victim in his sights. Hamilton slides past Vandoorne to move into 11th place. He's making heavy work of it but Hamilton is making progress through the field. Through the stadium section and Vettel is taking stock of where best to get past the Williams of Stroll. He closes up with the aid of DRS, and easily takes the place - Stroll stays well out of the way of the charging Ferrari. Now just six cars on the lead lap, and Vettel posts the fastest lap of the race so far - 1:19.516. Team radio from Lewis Hamilton: "What position do I need?" "Vettel is currently P5. He needs P2." "Is that possible for him?" "Negative. Valtteri now sat in P2, holding that spot." Massa makes his car as wide as possible but can't hold off Hamilton, who moves up to P10 and into the points. Marcus Ericsson crawls into the pit lane, his Sauber on fire. The extinguishers spray as he climbs from the car. Meanwhile, Vettel has easily dispatched Ocon and is up to fourth. Kimi Räikkönen is 23 seconds ahead of him now. Team radio to Sebastian Vettel: "Kimi is 23 seconds in front." "How many seconds did you say?" "Oh mamma mia. A little bit too much." Carlos Sainz comes into the pit lane to retire, that's four of the Renault powered cars that have retired, and a double DNF for the Renault team. Hamilton is looking for a way past Alonso, but the McLaren keeps him behind for now. Tweet from @pirellisport: So we thought this would be a straightforward one-stopper. A big thanks to our championship protagonists for making it more varied! Hamilton can't get close to Alonso, whilst the McLaren is looking ahead to try a move on Magnussen. New lap record for Sebastian Vettel out front - 1:18.892. Alonso isn't making it easy for Hamilton, and the pair dive this way and that. Alonso stays ahead with five laps to go. Alonso says he has no deployment on the straights, his energy recovery isn't doing what he expects it to do. Brake dust kicks out as Alonso makes life increasingly difficult for Hamilton. They are side by side through many corners, eventually the DRS getting the better of the McLaren. Alonso fights back, and he's not letting it go. Hamilton breaks free for now, he's in to ninth place. Vettel making little progress in fourth. Max Verstappen wins the Mexican Grand Prix! Lewis Hamilton wins the 2017 World Championship! Bottas second and Räikkönen third. Only four drivers on the lead lap by the time they cross the finish line. Hamilton holds his helmet in his hands as he takes in the feeling of being a four times world champion. In the garage, Toto Wolff and Niki Lauda share a resounding high five. Hamilton and Vettel run side by side on track, Vettel waving congratulations at Lewis as the Mercedes passes by. Hamilton grabs a British flag from a marshal and waves it as he continues his slow tour of the track. Meanwhile, Verstappen climbs from his car and celebrates race victory! A great race for Verstappen, who finally had a bit of luck when it comes to reliability. Four of the six Renault engines retired from the race, but his held out for the win. Not a traditionally great race, but intriguing from the start. The action tailed off towards the end, but the crowd made up for that, roaring at every opportunity. There are two events left on the calendar, with Brazil and Abu Dhabi now set for the midfield battles to be decided and, of course, for pride.